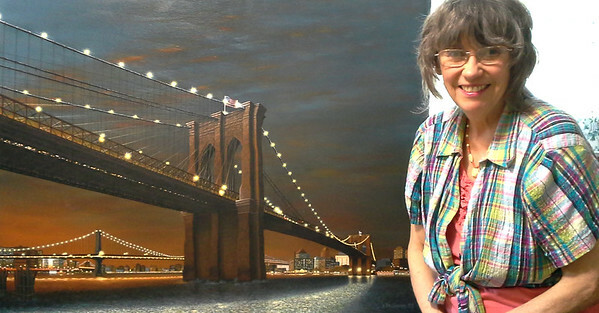 CONTACT INFORMATION: DORIS SAMPSON, Star of the North Studio; Duluth, MN. 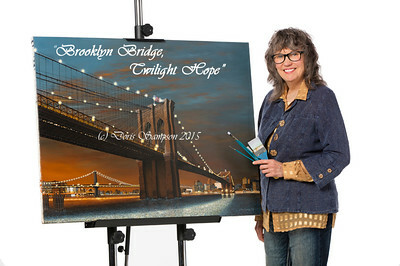 “Brooklyn Bridge, Twilight Hope” . . . 2015 Artist’s 50th Career Anniversary & Lifetime Masterpiece! Studio Visitors Welcome by Appointment Only. Contact the Artist: doris.starofthenorth@gmail.com. For Accurate Documentation of Product Inquiries, please Contact by Email. Career Porfolio Website: dorissampson-lenscanvas.smugmug.com Facebook to follow Current Activities...Click "Like" in the header. http://www.facebook.com/mycreativecircles THANK YOU! D.S. 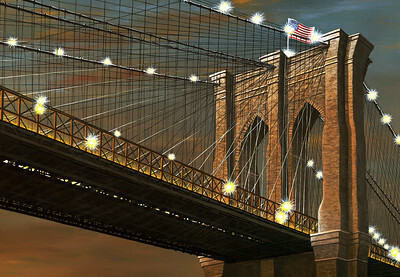 NYC #2: The Original Acrylic Painting was 30" x 40". 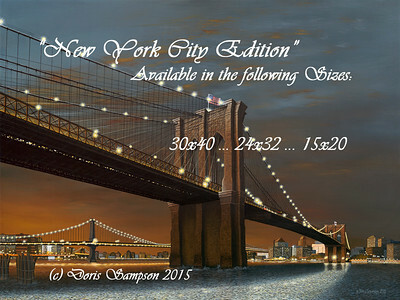 ONE: Giclee Print SIZE OPTIONS for the “New York City Edition” are fixed to three choices, whether Paper or Canvas reproductions: 30x40, 24x32 or 15x20 . . . these are the IMAGE SIZES. There is also a 2” white border around the each of the Image Sizes. For Paper Prints, this is matted over with different additional frame style options. (A black border can be chosen for a Canvas Print, if it is to be “Gallery Wrapped”. These canvases are mounted on heavy duty stretcher bars; the Canvas wraps around without staples, and the product is hung unframed.) 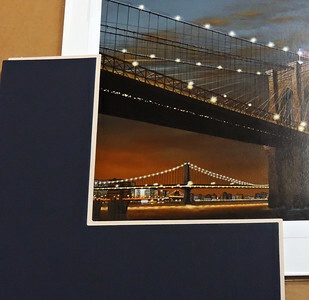 TWO: Is there a difference in APPEARANCE between the Paper and Canvas “NYC Edition” Prints? Yes. The Paper Prints have a subtle Lustre surface, which is lovely! The Canvas Prints, being on canvas have an attractive fine-toothed canvas texture surface. The semi-gloss sealant application by Custom Photo Imaging upon the Canvas Prints leans slightly more glossy—but not at all overtly so. The slight increase of ‘glow’ from the semi-gloss sealant on the Canvas brings out colors and contrast across the Image a bit more noticeably. The colors of the Custom Photo Imaging Prints are EXACT to the Original Painting . . . which was deliberately painted with a subdued late-twilight sky. But if one’s preference leans more toward ‘slight increase in glow and contrast’, Canvas is the choice. NYC #3: Sample of a DOUBLE MAT placed at the corner of a "NEW YORK CITY EDITION" 24x32 Paper Giclee Print. The next step is to frame it, including Conservation Glass; either Clear or Non-Glare. THREE: Are there other important differences between the Paper and Canvas “New York City Editions” in regard to how they are MOUNTED / FRAMED? Yes. Professional conservation matting and framing of the Paper prints is necessary—BUT THAT'S ALL THAT NEEDS TO BE DONE. The quality art paper is its own ‘ground’. 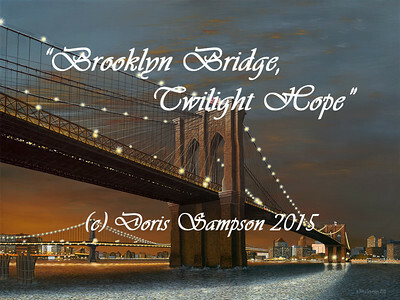 (Locally, Doris Sampson does not do that degree of professional framing. Joelene Steffens of Art Dimensions in Carlton is Sampson’s pro contractor for framing. Orders for any Star of the North Studio product can be fielded through Art Dimensions, if the Buyer desires.) Shipping of Paper prints is simple—this is done by Custom Photo Imaging to Sampson’s Customer immediately after printing is completed. Paper prints are shipped FLAT. FOUR: Canvas prints require more work and more cost factors. Custom Photo Imaging manufactures the Canvas print but does not install it on stretcher bars; which are necessary prior to installation of a frame, preferably by a professional framer. The Artist’s hands can no longer handle stretching the canvas on the bars—and this applies to local purchases only anyway. Materially speaking, the canvas used by Custom Photo Imaging is so sturdy that it’s going to take stronger, if not younger hands than the Artist’s. Art Dimensions can install the canvas to stretcher bars for local purchases. However, this does not include the new “Gallery Wrap” version of installation. “Gallery Wraps” do not need frames. Canvas Prints are mounted on heavy duty stretcher bars with no staples appearing on the ouside edges. The bars under the Canvas have a depth of about 2"; and this is how they are hung, unframed. At this time, Art Dimensions does not do Gallery Wraps. Currently it isn’t known if any gallery in the Twin Ports area does. So it’s best to think of normal framing for a Canvas Print—at least in this area. FIVE: Therefore, all non-local Canvas print purchases must be completed by the Buyer at their location; and absolutely using professional gallery services. This is so important that the advice is to NOT use any gallery that does not have EXPERIENCE stretching canvases to bars to professional quality! Then the framing should also be completed immediately by the pro-gallery. (Or “Gallery Wrap”, if that service is professionally available.) Technically, a Canvas print can also be secured by dry mounting onto ½” thick acid-free foam board; a product that is made specifically for conservation of art/photos, and used by pro-galleries that have such mounting equipment. Such a mounted piece can be framed then. While not necessary, adding a linen liner to that frame, bordering the Image, would definitely enhance the entire presentation! SIX: At this writing, it’s thought, but not yet confirmed, that Canvas Prints can be rolled and shipped in a sturdy ‘heavy duty’ tube. S&H would be around $15.00; whereas shipping flat would be minimally $25.00. To date, this is known only for the 24x32 print. How to ship will be the choice of the Buyer at the time of Order placement. Shipping options must be pinned down with the Buyer before proceeding. STUDIO EDN. #1: The Artist also wants to permanently retain her own personally printed “Studio Edition”; published on her newest-manufactured Studio Level Epson SureColor P800 Large-Format Giclee Printer; for exceptional quality and clarity Reproductions. STUDIO EDN. #2: Different Photo-Art Giclee Paper between the two Edition’s printers, and different technical Color Calibrations of the Epson Studio Printer produce a distinctly unique, and spectacular-in-its own presentation. If you detect slight color differences between these Editions, this is the reason. Therefore, color presentation may be another determining factor in the Buyer’s choice. 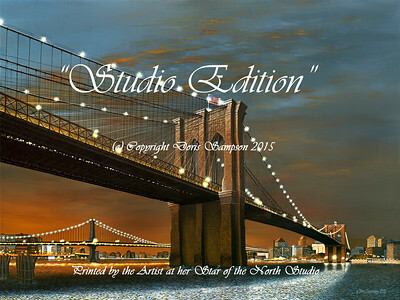 Additionally, Size Options for the “Studio Edition” are smaller than the “New York City Edition”, with more size choices available: 8x10 and anything in between up to 17”x 22”paper size. Price Options are more economical under “Studio Edition” choices. Both are purposely planned as such by the Artist so that EVERYONE who would like to own and display this beautiful Painting can easily do so! There is no Canvas Edition available under the “Studio Edition”. “Studio Edition” prints are published on either Epson’s Ultra Premium Photo Paper- Lustre (recommended for more ‘glow’), or Epson’s Ultra Premium Presentation Paper-Matte. If the Buyer intends to frame the print without a mat between the Print and glass (with the print next to the glass) then choose Matte Paper. STUDIO EDN. #3: "Studio Edition" Details Continue. NOTE: To create certain “Studio Edition” Size Options the Artist has either cloned more sky higher, or cropped from the sky, in order to alter the Aspect Ratio (format) of the Original 30x40 Painting. If you compare NYC Edition ORIGINAL-ASPECT RATIO-posted images to Studio Edition images, and you detect a difference in the sky . . . this is the reason. It was necessary to “create space” made of more sky, or remove sky, to achieve the following Size Options to benefit Customers’ desires for a variety of Size choices: 8x10, 11x14, 12x16, 12x18, 16x20 & 17x22 . . . (UPDATE 2/9/16: The Studio Edition will be published at only 8x10, 11x14 and 16x20. However, those other sizes can be special ordered.) 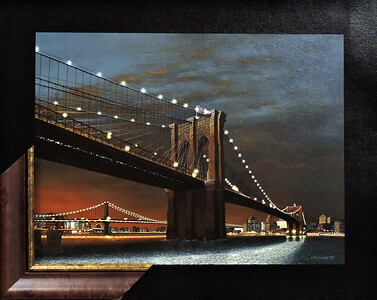 (The NYC Edition is 100% accurate to the aspect ratio of the Original Painting—which is why there are only three fixed Size Options. Original aspect ratio is unalterable for this Edition.) Is either Print Series a “Signed and Numbered Limited Edition”? The “Studio Edition” will never be a Limited Edition. This is for ownership by ALL at economic prices. 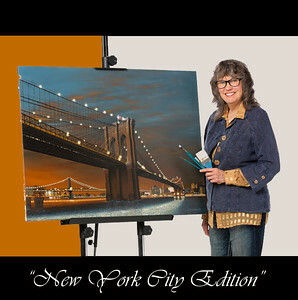 It is not known yet if the Artist will be advised professionally by New York City gallery/ies that the NYC series SHOULD be a Limited Edition. Right now, the NYC series is a “Launch Experiment!” So those who want to preserve the current Price level, should order! STUDIO EDN. #4: Finally finished!!! Mid-August, 2015!